Caesar's Empire Video Slot Guide & Review - Casino Answers! Caesar’s Empire is a 5-reel, 20-line video slot developed by Realtime Gaming, featuring wild substitute symbols, scatter wins, multipliers, a free spins feature and a progressive jackpot. You can play the Caesar’s Empire Real-Series Video Series at US-friendly casinos Aladdin’s Gold Casino and Bovada Casino. Bets available on the Caesar’s Empire slot machine are $0.01, $0.02, $0.03, $0.04, $0.05, $0.06, $0.07, $0.08, $0.09, $0.10, $0.25, $0.50, $1, $2.50 and $5 per line. You can also select the number of paylines you wish to play (up to 20). The lowest total bet possible on Caesar’s Empire is a penny per spin. The highest total bet on Caesar’s Empire is $100 per spin. To play the Caesar’s Empire video slot, hit the “Spin” button to spin the reels. At any time during a spin, hit the “Stop” button to use the Caesar’s Empire skill stop feature and manually stop the reels. The Caesar symbol is the wild symbol on the Caesr’s Empire slot game. 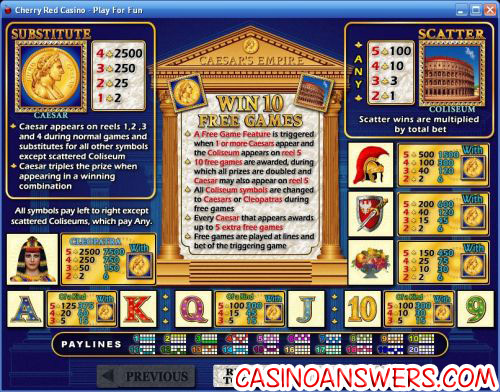 It appears on reels 1, 2, 3 and 4 during the regular slot spins and substitutes for all symbols except for the Scattered Coliseum symbol. When the Caesar symbol completes a winning combination, it will triple your prize. The Caesar symbol will pay up to 2500 coins for four symbols. The highest paying symbol on the Caesar’s Empire video slot is the Cleopatra symbol. On its own, the symbol will pay up to 2500 coins. 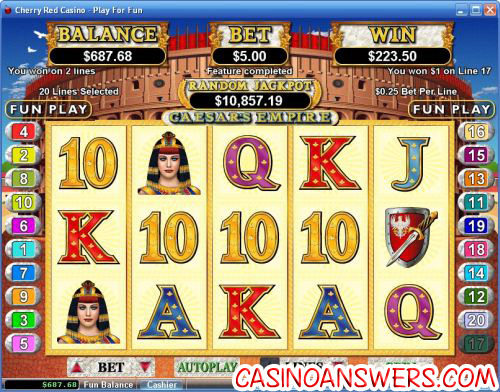 However, when four Cleopatra symbols combine with a Caesar symbol, you can win the top jackpot of 7500 coins. The scatter symbol on Caesar’s Empire will pay up to 100X your total bet. You can win 10 free spins with a 2X multiplier when one or more Caesar symbols appear alongside a Coliseum scatter symbol on the fifth reel. During the free spins feature, the Caesar symbol will appear on reel 5. All Coliseum scatter symbols will be changed to either Caesars or Cleopatras during the free spins feature. For every Caesar symbol that appears on free spins will win up to 5 extra free spins. If you get lucky enough, you can pile on tons of extra free spins and win lots of cash at Aladdin’s Gold Casino! Caesar’s Empire is home to a progressive jackpot, which is currently at nearly $11,000 and rising fast! To win the Caesar’s Empire progressive jackpot, all you have to do is play. The jackpot is triggered at random with no winning combination required. Progressive Jackpot wins are added to other wins. Random Jackpot contribution is no more than 1.5% of the total Return to Player. Hit the “Autoplay” button to open the autoplay settings on the Caesar’s Empire slot game. You will be able to set the number of spins, set it to stop when the jackpot is won, stop if a win exceeds or equals (any amount you input), stop on any win, stop if your balance increases/decreases by any amount you input and stop once the feature is triggered. You can stop Caesar’s Empire’s autoplay mode using the “Stop Auto” button. You can also find Turbo Play in the autoplay settings to speed things up. Caesar’s Empire offers an excellent free spins feature that only requires two symbols to hit, a progressive jackpot and lots of high payouts. It fits in with the rest of the Real-Series Video Slots, which all have similar features and high-end presentation. To play the Caesar’s Empire video slot game, please visit Aladdin’s Gold Casino! Are players from the United States able to play the Caesar’s Empire video slot? American players can take advantage of the 200% unlimited signup bonus at Aladdin’s Gold Casino or play Caesar’s Gold at Bovada Casino. Where can I play a free Flash game of the Caesar’s Empire slot machine? For a free Flash game of the Caesar’s Empire video slot, you can visit either Aladdin’s Gold Casino and Bovada Casino. You can play for free or play for real money. If you experience problems with the Instant Play Flash casino software, make sure you have the newest version of Adobe Flash Player installed. Does Caesars have a slot machine? Does Caesars have an online flash game?